The Ultimate Team Search - THE VOICE Battle Rounds 2 Premiere Recap! The Ultimate Team Search – THE VOICE Battles Round 2 Premiere Recap! Adam Levine said “I thought it was flawless. 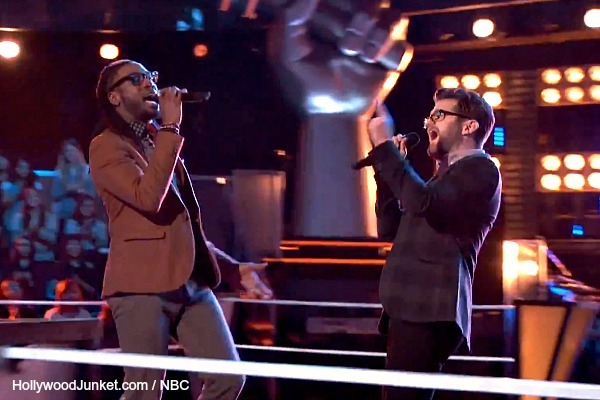 Congratulations guys (Delvin Choice and Josh Kaufman), you made it impossible for me.” From THE VOICE season 6 episode 11 PLUS Photos, Coach’s Comments & More. The artists get to chose their songs for their battle from a short list of songs. The coaches will have one final steal. Blake’s team is first. In these rounds, each artist gets to talk to their family members before going into their battles to get their words of encouragement. Each team also gets the priceless advice from “Coldplay” vocalist Chris Martin. Blake said he likes having Martin as an adviser but wishes he wasn’t advising all of the teams. Megan said she was surprised to be paired with Audra and said that she didn’t want to do a country song. Megan said Audra “has such color and control.” Audra said “Megan, she’s a rock star. She has that stage presence that I need to work on.” They got a short list of songs to choose from. They picked “The Climb” by Miley Cyrus. When they told Blake and Chris Martin the song that they picked, Martin asked if Miley twerked in it. Audra said if she loses the battle, she’ll return home and finish her Medical Assisting Degree and will have no future in music. Megan said if she loses the battle, she’ll go back singing for tips. Cierra said she felt like she was at a disadvantage because T.J. goes to music school. T.J. said Cierra is a powerhouse vocalist. They chose to sing “Get Here”. T.J. said, “We felt that the song choice showcased the best of both of our voices.” T.J. got star-struck by Chris Martin. “The fact that we can connect on something as minute as a lyric about wind surfing says a lot about the power of music”, said T.J. about Martin’s comment to him about the wind surfing lyric. T.J. said winning this performance could mean one step closer to getting his family out of their unfavorable neighborhood. Shakira commented on the battle, “Cierra I’m so proud of you. You were unbelievable. T.J. you are a phenomenal singer, both of you, it was perfect” and finished off, with “I just have this to say,” as she bowed to them. Blake told Tess that she won her battle from the first rounds. Jake was feeling intimidating by Tess because she “is quiet the performer,” he said. They decided to sing “Have a little Faith in Me”. The song is “the perfect blend of what Tess does, and just Country enough for Jake – Said Blake. Jake said Tess has a “crazy low range” and has a better one than he has. Tess said if she loses the battle she will have to go back home and take pre-law classes, but really wants to be an entertainer. Coach Blake said, “my liver is not going to make it. Jake – it was so believable because you believe what you are singing. Tess, for me, it blows. Because I have to sit here and figure out what to do.” He chose Jake as the winner. Blake said he chose Jake because, “I have no doubt that Jake is going to go very far in this competition and I think he’s going to be a star.” Blake said he is excited about introducing him to Nashville. Shakira said she put Josh and Patrick together because they both have “similar styles.” Patrick and Josh were both stolen by Shakira from Team Adam during the first battle round. Shakira said she thought the song “Run To You” was more of Patrick’s style. Chris Martin said, “There’s no way I’d be able to sing that song. Only certain guys can and luckily you both do.” Martin also said Josh’s voice is great but “he needs to work on his looseness.” Shakira observed, “technically they are almost perfect, they just need the conviction.” Shakira told them that they both just have to sell it, and she’ll buy! Coach Shakira was happy with Patrick’s “rock star” antics and said, “I asked you for a big rock star moment, and you gave that. And how awesome was that. Patrick you really challenged yourself. That makes me feel so proud. Josh you delivered a really amazing, solid performance. This battle was even matched. Because I need a voice like yours on my team and I feel like I can coach you better, it’s Patrick. Adam called them his “soul brothers”, and told them that they are both amazing singers. They chose to sing “Signed, Sealed, Delivered, I’m Yours”. “It’s a perfect choice for them, they both have big beautiful voices and they punctuate this,” Adam said about their song choice. Adam said, “Josh is smooth, he’s a crooner. Delvin just has this monstrous voice. That’s going to be my toughest decision is choosing between Josh and Delvin.” Before the battle, Delvin said he’s going to sing to his Grandma who was in the audience because it may be her last time, and it may be his last time. Watch THE VOICE season 6 episode 14 “The Battles, Round 2 Premiere” first aired by NBC on Monday, March 31, 2014. This full episode is now available at HOLLYWOOD JUNKET until 06/19/14 courtesy of NBC. ENJOY!